Are you an avid traveler who’s about to explore the world? Are you keen to explore the ultimate Alaskan wilderness? Then, you should visit Glacier Bay National Park – a place that offers limitless opportunities for both adventure & inspiration. It is a terrestrial and marine sanctuary spanning over 3.3 million acres. Glacier Bay National Park is best known for its mighty mountain ranges, massive glaciers, wild coastlines, exotic rainforest, & deep sheltered fjords. From sea to summit, this place allows you to witness vast Alaskan wilderness of dynamic glaciers, mountain goats, brown and black bears, & migrating humpback whales. As a World Heritage Site, this place is an ideal destination for those seeking exotic wildlife, kayaking, or merely a chance to get away. How to explore Glacier Bay National Park? If you want to witness the magnificent scenery and adventurous wildlife of Glacier Bay, then the best option is to explore it by sailboat. Adventure Flow offers you an exclusive opportunity to explore this heritage national park while spending 6-8 days sailing around the Glacier Bay. In fact, with this exquisite Alaska sailing opportunity, you’ll have enough time to paddle in kayaks, meander around the shoreline, trek around the deep blue glaciers, hike in the rainforest, or simply relax and enjoy the spectacular scenery on board the boat. This is a flagship multi-day tour that departs from Juneau, Alaska in April of 2017. Your trip starts on-board the spacious 54 foot sailboat, the S.V. Arcturus as a home base for launching out to the ultimate Alaskan experience! 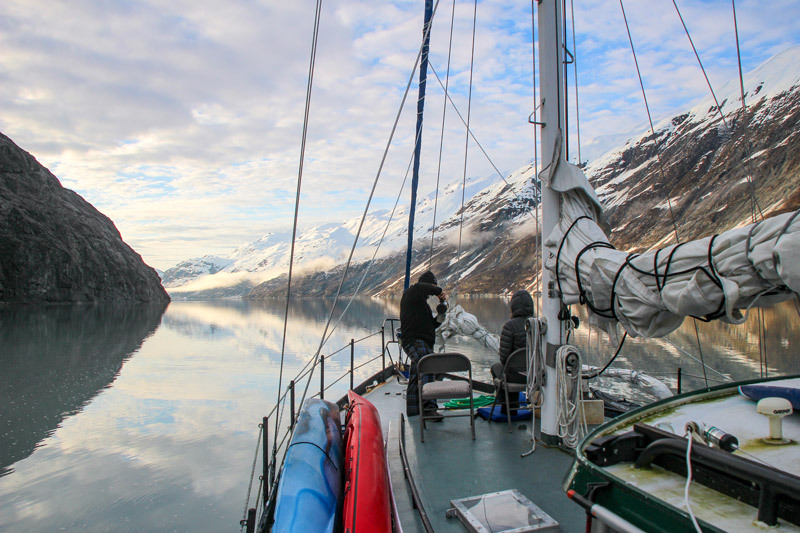 On the day 1 itself, you are acquainted with Captain Hoock and your guide while learning the ropes of sailing and slowly gliding to the ultimate destination – Glacier Bay. Next, on your way towards Glacier Bay, you’ll explore the incredibly beautiful Beardslee Islands while paddling through the splendid shorelines and mountain peaks. And if the weather permits, then you can even wrap up the day with a wonderful moonlight paddle in a kayak, packraft, or even a stand-up paddle board. Obviously, Glacier Bay National Park is best known for its massive icebergs and glaciers. Throughout your journey, you’ll step out into the enormous world of ice and abundant sea life while trekking around the myriad of icebergs and kayaking through the sea water. The paddling experience of the marvelous beauty of an advancing tidewater glacier (around the Grand Pacific and Margerie Glaciers) is truly majestic & mystical. As well as the lesser visited Muir Glacier on the east arm of Glacier Bay. Finally, before sailing home, the Arcturus cruises you to Bartlett Cove where we will relax and reflect on the grand adventure we just experienced. With this, you will complete an adventurous trip to great Glacier Bay National Park with multiple opportunities to adventure through paddling, hiking, trekking, kayaking, or even leisurely resting on the boat. This exclusive tour can present you a completely unique and exotic experience compared to sailing on a big cruise ship. Mainly, the big cruise ships stay only one day around the national park where you don’t get enough opportunity to discover the place to its fullest. We love giving our guests the chance to get off the boat and gain a true connection with the beautiful landscape. Embark on an adventure beyond words. Create great memories to cherish, and cruise the ultimate Alaskan experience while sailing around Glacier Bay. To learn more about Adventure Sailing tours, visit our sailing details page here.